This charger was kindly sent to me for review by GearBest. Coupon: GBLED2016 for 8% off. No other payment was received for this review, and a free charger does not stop me from being critical when required during reviews. XTAR have a good reputation for quality li-ion and NiMH chargers, and good worldwide distribution. 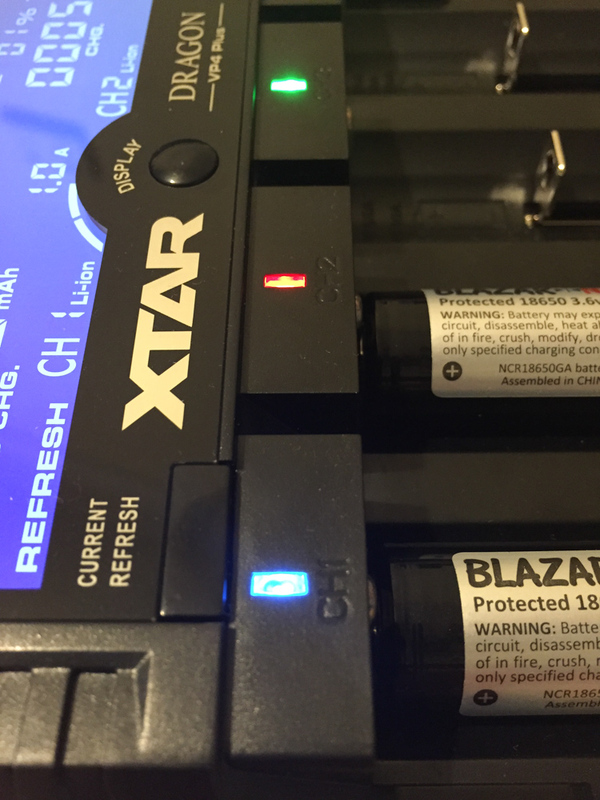 Whilst other manufacturers such as SkyRC, Opus, and Liitokala have had analysing chargers on the market for a while, this is XTAR’s first foray into analysing chargers. Do good things come to those who wait? 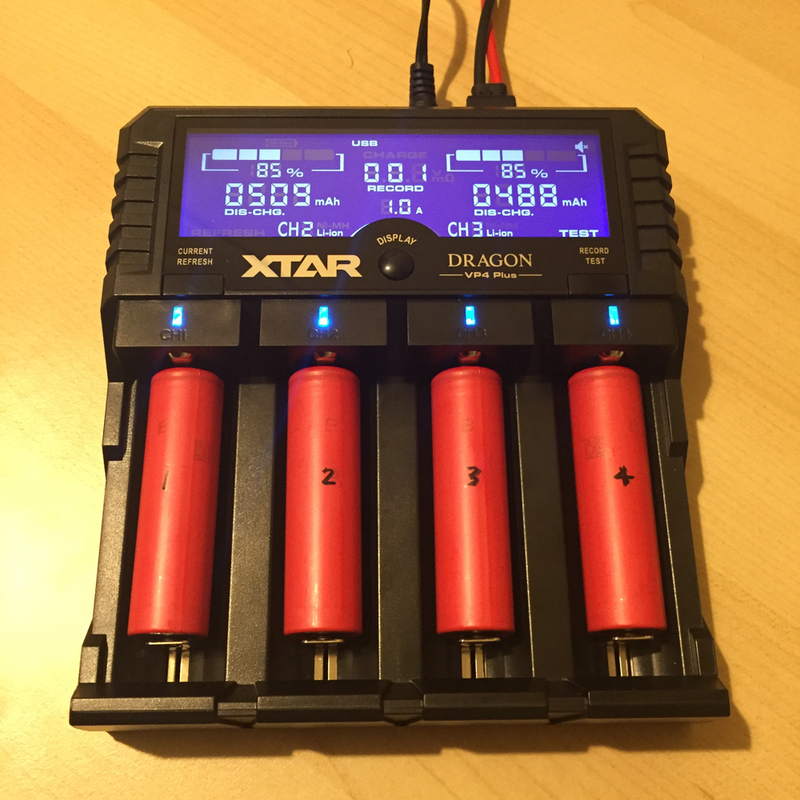 The XTAR DRAGON VP4 Plus is solidly constructed from heat resistant plastic. It is much larger than most other 4-bay chargers which allows for fan-less heat dissipation (unlike the Opus BT-C3100), and makes it much easier to get cells in and out of the slots (unlike the Liitokala Lii-500). The slots can handle long protected 18650 and 26650 cells up to approximately 72mm in length. As with nearly all other chargers, if protected 20700 and 21700 cells arrive on the market, they may have issues fitting. 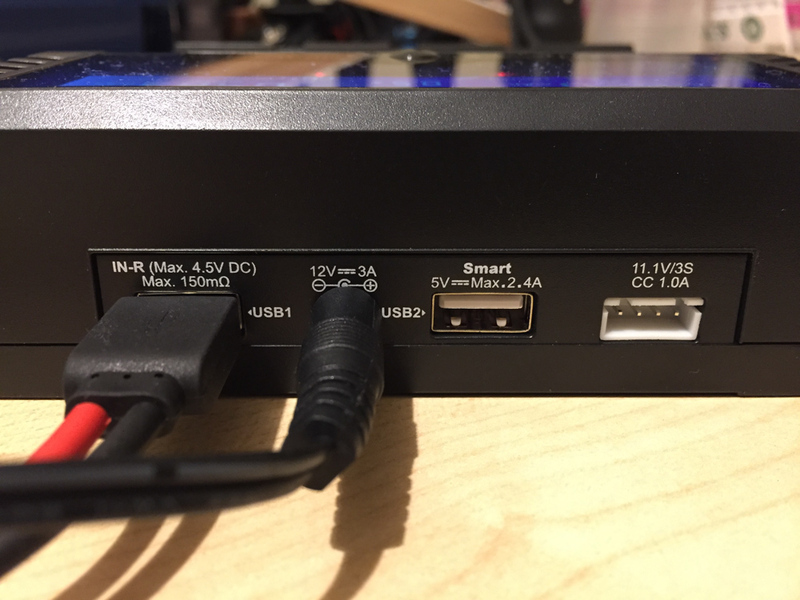 There are connections for the 3A/12V power supply, USB output, USB connection for test probes, and JST-XH for 11.1V/3s battery pack. I prefer chargers with 12V power supplies as they are typically more stable than USB power supplies. Left – Current/Refresh button – short press will change current, long press will start refresh cycle. Middle – Display – change between displayed slots, long press will set the display to low brightness, double click returns to main screen. Right – Record/Test – short press will recall saved test data, long press will start a test cycle, double click will turn sound on/off. Note: When display brightness is dimmed, the first press of any button will restore it to max brightness. 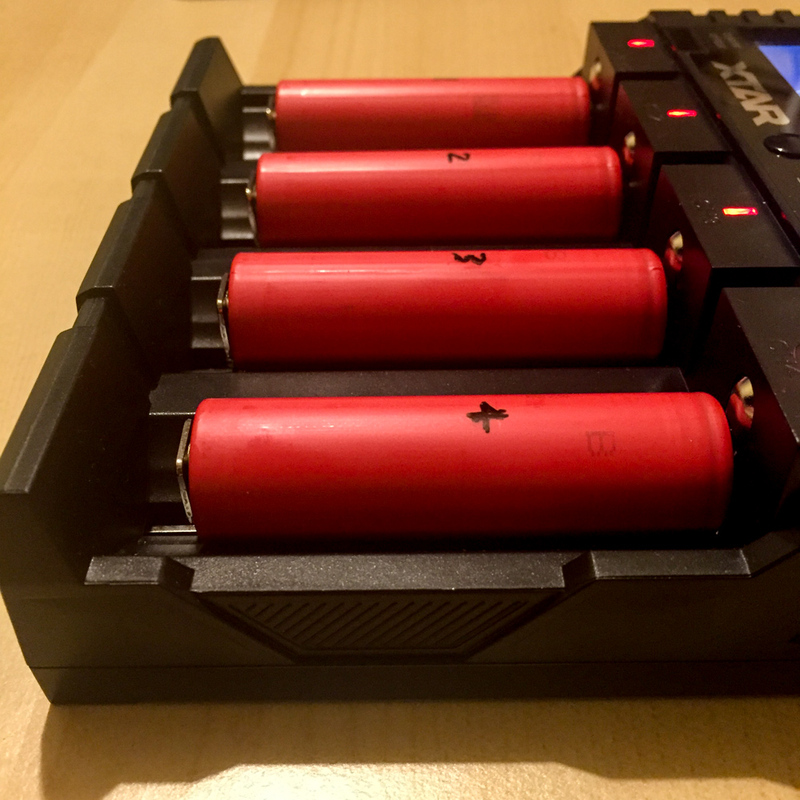 Green – Battery fully charged/reverse polarity/poor connection. The screen displays 2 slots at a time, which can be changed by pressing the middle button. 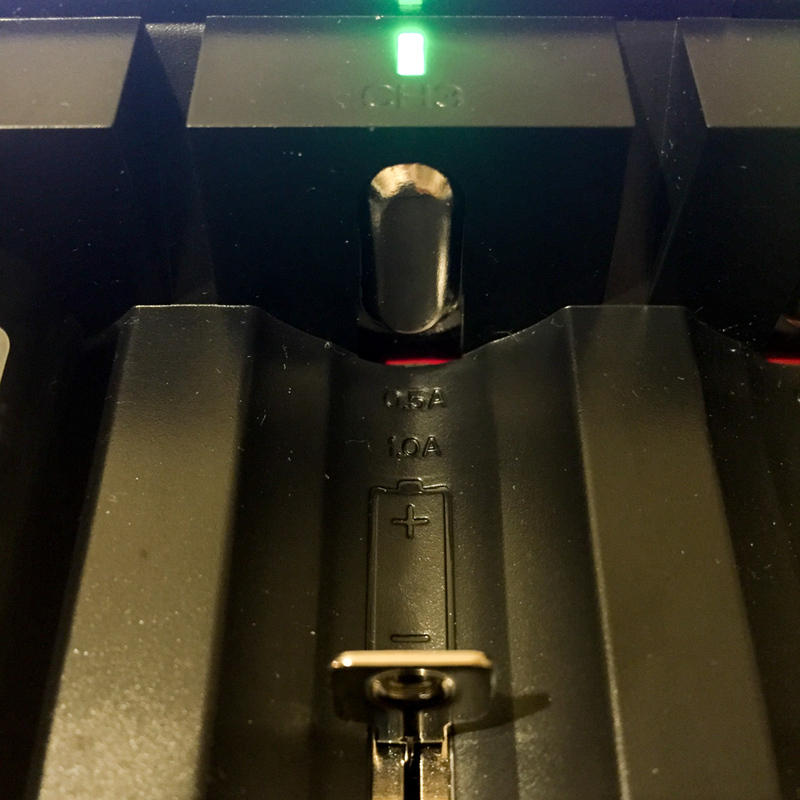 When charging 2 cells, the charger automatically displays the slots in use. With 4 cells, this alternatives between slots 1 and 4, and slots 2 and 3. The screen can show % charged, mode, charge current, charge current, battery type, and displayed slot. Voltage and iR measurements from the test probes are shown in the middle of the display. The display also had an animated bar effect for charging and discharging. There is no time counter. Unlike some other chargers, the screen is still easily readable when dimmed which is useful. When charge mode is complete for each slot, there is an audible beep, and the amount charge display alternates with “FULL”. There are also beeps with each button press. The beep can be quite useful, and can also be turned off if you don’t want to wake anyone up. The charging rates are 0.5A, 1A, and 2A (latter in slots 1 and 4 only). These charge rates suit the majority of commonly used batteries, though the lowest charging rate of 0.5A is relatively high compared to other analysing chargers. This should be OK for Eneloop AAA and other AAA NiMH that can handle fast charging. However it may not be good for AAA NiMH cells that are not recommended for fast charging e.g. yellow/green Ikea Laddas have a 0.075A recommended charging current. Newer smaller li-ion cells such as 14500 and 16340 cells should be able to handle 0.5A, though it may be too high for some 10440 cells. Thus, I would recommend this charger only for use with NiMH and Li-ion batteries that can safely handle at least 0.5A charge rates. Only 3.6/3.7V li-ion batteries can be charged (to 4.2V), which is the majority of the intended market. LiFePO4 3.2V (3.6V max) and 3.8V (4.3/4.35V max) charging is unsupported. The default mode is charge. This starts automatically after around 3 seconds post cell insertion, so it is generally best to select the mode and current before inserting the batteries. However, the charger has a soft start, charging at a low charge rate for the first 10 minutes. Be aware that charge current can be changed during charge by pressing the charge button, and that the charge current defaults to 1A when turned on. During testing, I experienced a brief mains power outage, which was enough to change the charging rate from 0.5A to 1A. XTAR should change the default charging rate to 0.5A in future revisions. All slots/bays have to use the same charge current and mode. 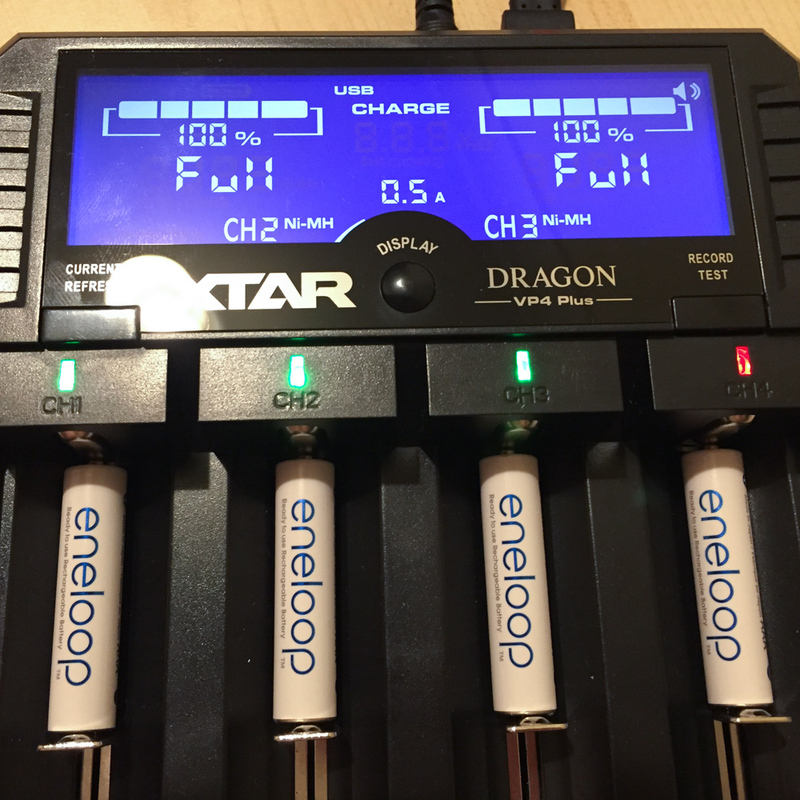 Thus you can charge an 18650 in slot 1, and AA Eneloop on slot 2 on the same charge rate e.g. 1A. However, you cannot charge an 18650 in slot 1, whilst running test mode on an 18650 in slot 2. Neither can you charge at 1A in slot 1, and charge at 0.5A in slot 2. This may be an issue for some users, but I personally prefer to charge and test in batches of the same battery type. It is also possibly “safer” to charge this way, so that things don’t get mixed up. I should note that in test and refresh modes, the charger can charging and discharging in different slots. Batteries came off the charger at 1.48V for NiMH (Eneloops) and for li-ion came off the charger at 4.19V. This was measured using the test probes (see below). 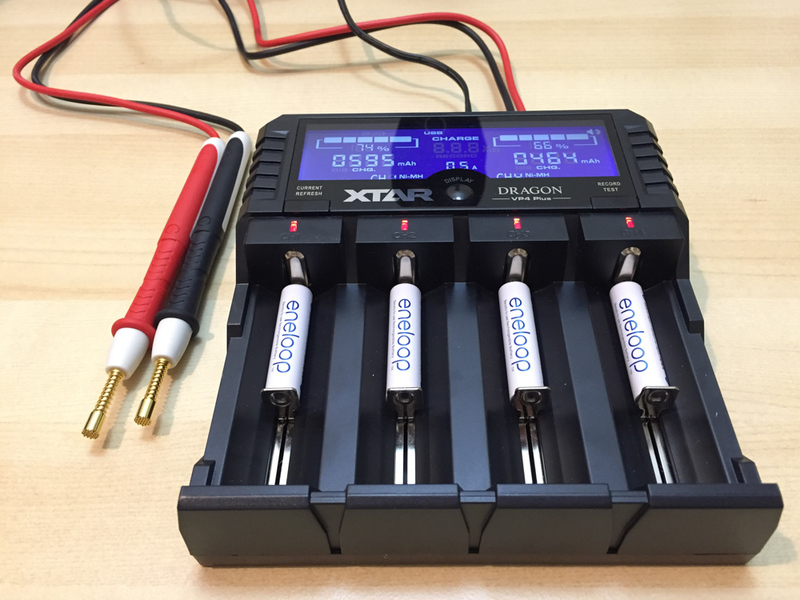 One of the unique features of the XTAR DRAGON VP4 Plus is the ability to test iR and voltage using spring loaded and gold plated test probes, in a similar way to testing voltage using a digital multi-meter (DMM). DMMs can be a bit intimidating to some users, and thus this is an excellent feature. As the functionality and measuring ranges are limited, it cannot fully replace a DMM – for example you can’t use it to test flashlight tail cap current. I have been using the test probes to test iR and Voltage for each cell both before and after charge. It can also be useful to test voltage so as to decide if cells need charging or not, or even test voltage and iR on cells before and after being charged on other chargers (such as a slow NiMH charger). The test probes can be used whilst other cells are charging, but you cannot use them on cells in the slots/bays. The measurements with the probes were fairly consistent (+/-15%) as long as good contact was made, and are in theory an improvement over the measurements on the Lii-500 and BT-C3100 which have to account for multiple objects in the path of resistance. To use, the probes have to be touched together, which zeros the display, then they can be used to test the voltage and iR. The probes are directional (red probe is used for the +ve end of the battery, and the black probe for the -ve end), and thus if polarity is reversed, they record zero. The probes can be a bit fiddly to use with smaller cells. It is also easy to accidentally touch the probes together, making the display change to probe mode (other functions still continue in the background). The test (charge-discharge-charge) and refresh (discharge-charge) functions have a relatively low cut-off at 2.6V for li-ion. This did not trip protection circuits on the protected cells tested (two Blazar protected Sanyo NCR18650GA 3500mAh, which has the PCB set to cut off at 2.5V+/-0.1V). Most newer li-ion cells from quality manufacturers should be able to go this low, but some older or poor quality cells may not. Low cut off is 0.85V for NiMH. Discharge current is at least half of the charge current, at either 0.5A (for 1A or 2A charge rate) or 0.25A (for 0.5A charge rate). Capacity results were as expected given the discharge to 2.6V, and seem to be accurate and consistent. A comparison between the XTAR DRAGON VP4 Plus’s charge and discharge test and the Lii-500 discharge test on four Sanyo NCR18650GAs is below. Whilst there is no dedicated discharge for storage mode for li-ion, as on the SkyRC MC3000, it is possible to just use the refresh mode to discharge the cells, and remove them from the charger at around 40% charge. There is no fan, and thus when discharging in all 4 slots (tested in indoor 30C ambient heat) the base of the charger was very warm. Despite the large size of this charger I found that handled heat only marginally better than the also fan-less Lii-500. If you have a laptop cooler/chill mat, I would recommend using it, though it is not essential. To select refresh or test modes, the left or right button needs a long press (respectively) before inserting the cells. When the refresh or test mode finishes, the display alternates between current discharged and current charged which is a nice touch. The test record and recall function is also potentially very useful. The % charge display seems to be reasonably accurate. However, there are some idiosyncrasies. The first is based on its algorithm, and possibly related to how voltage typically rises rapidly at the beginning of the charge from resting voltage. For example I pulled out an Eneloop at 13% full and then placed it back in the charger 10 secs later, which then shown at 58% full. Later during the charges the % charge display returned back to more expected figures compared to the other Eneloops being charged. The same was repeated for li-ion, but with less of % jump. The display also stays on 99% for a little longer than expected during li-ion charging. When discharging, 01% is displayed for quite a long time. This is probably due to the discharge function discharging to well below what is deemed to be an empty battery by the % charge indicators (e.g. the charge discharges to 2.6V, but 01% charge reading may be based around 3.0V). I don’t have any 3S battery packs to test that functionality. This functionality will be useful for users of RC toys and other devices that use 3S battery packs, and could avoid users having to purchase seperate chargers for li-ion, NiMH, and 3S battery pack charging. 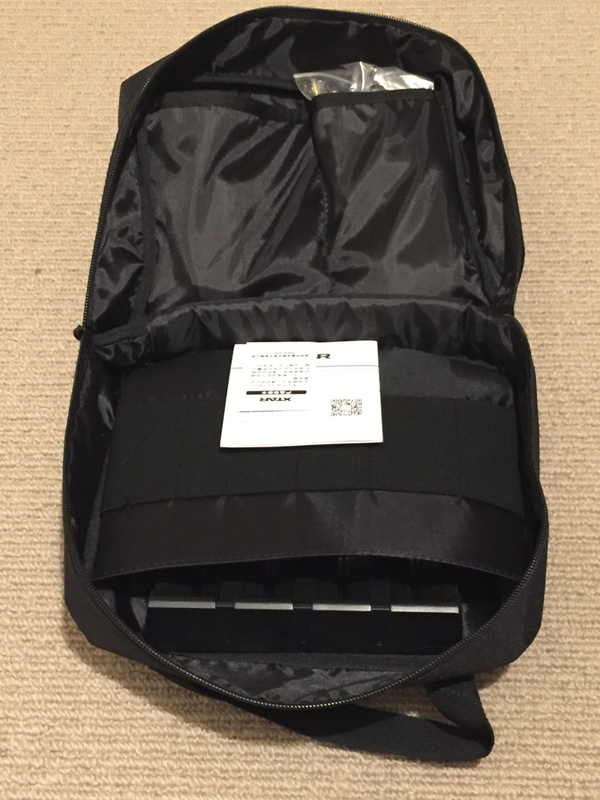 The default charge rate for 3S battery packs is 1A. The USB output and power bank functionality was not tested in any depth, other than to test that it works. The 0V activation functionality was not able to tested as I’ve never discharged a cell below 2.9V resting voltage during use. Reverse polarity detection was tested successfully, “Err” is displayed with a rapid beeping noise when reverse polarity is detected. 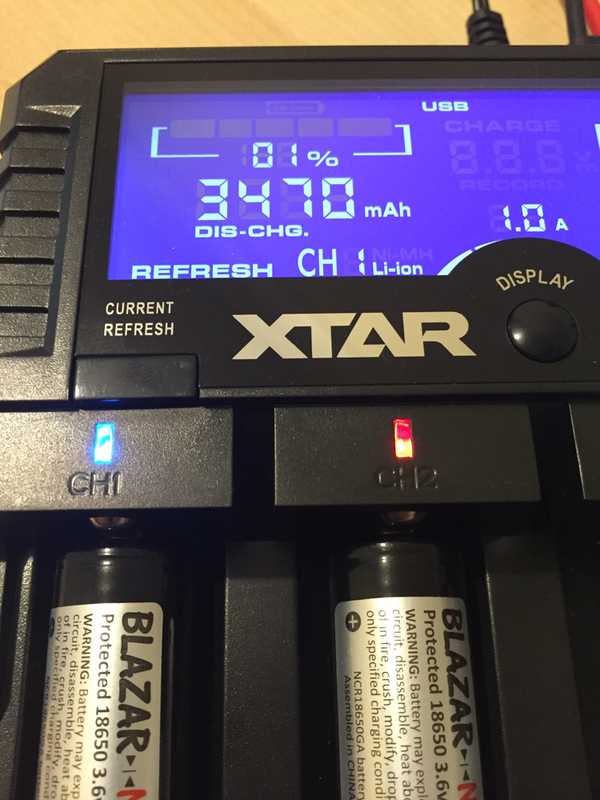 There has much discussion on internet message boards about the lack of voltage display during charing on the XTAR DRAGON VP4 Plus. Whilst there are plenty of popular li-ion and NiMH chargers that do not show voltage, all well known analysing chargers display the voltage during charging. Instead, the XTAR DRAGON VP Plus shows the above mentioned % charge value. It could be argued that users knowledgeable enough about batteries to want to purchase an analysing charger, would also be knowledgeable enough to be able to approximate the charging state based on the voltage alone. It could also be questioned, that users will “trust” a charger more if they can see what it is doing (i.e. if voltage has become stable at around 4.2V near the end of the charge, that it is close to termination). On the other side of the argument, is that it is good practice to measure voltage before and after charge with a DMM (or in the case of the XTAR DRAGON VP4 Plus, the test probes). This provides the user as to state of discharge (e.g. if the voltage is below 2.5V you might want to be a bit careful), or how well cells used in series are balancing during discharge. It also allows the user to check that the charger is terminating at the correct voltage. Thus the lack of voltage display may be a good thing if it forces the user to check cell voltage before and after charge using the test probes. This subject could be discussed until the cows come home, so I’ll stop now. I would personally prefer voltage display during charging along with the animated bar to show approximate charge progress. However, the lack of voltage display during charging would not stop me from purchasing this otherwise excellent analysing charger. - Build quality is excellent, and the device functioned correctly. - The charger can charge and analyse most newer NiMH and 3.6/3.7V li-ion batteries, as long as they can handle at least 0.5A charging rate, and are less than 72mm in length. - The user interface is fairly easy to use, and record function is useful. - The test probes are a useful and unique feature for analysing chargers. - The lack of voltage display during charging is a bizarre omission. The % charge display has some idiosyncrasies, and default charge rate should be 0.5A instead of 1A. 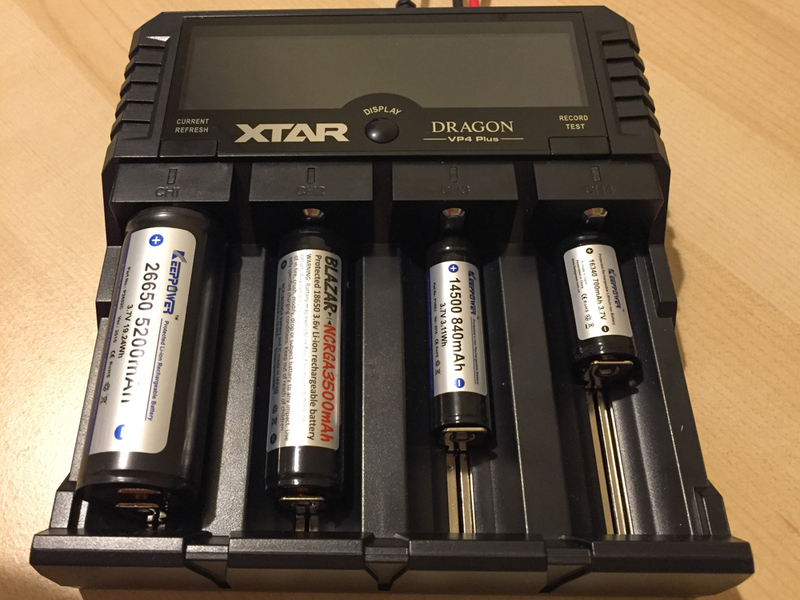 The XTAR DRAGON VP4 Plus is clearly aimed at those who want to charge and analyse a wide range of batteries, but with a simple user interface, and don’t want to worry about using a seperate DMM to test voltage and resistance. With a relatively high price point, and some limitations (note: no analysing charger is “perfect”), it won’t suit everyone. However with many flashlight users and vapers having high disposable income, I expect that the XTAR DRAGON VP4 Plus will be a very popular product for its intended market. I recommend this charger for users who want an easy to use, simplified, and well built analysing charger. They are both great analysing chargers, but very different. The DRAGON is more simplistic and consumer orientated. The MC3000 is more configurable, but also more complex, and aimed at the hobbyist market. Make sure you do your research before choosing one over the other. I’ll try and add a few videos over the next few days. I’m a huge Xtar fan. I have 6 that I’m completely satisfied with. That said, I think this charger is overpriced and lacks features that are useful to me, and has features I’ll never use.. This is why I’d buy the Skyrc 3000 over it once they iron some of the issues out such as the slider springs breaking off their mounts. In the meantime, I’m good with what I have. That said, thanks for the review. If you have an MC3000 then you probably don’t need the DRAGON, unless you like collecting expensive chargers. By the way, the springs on the DRAGON are nice and smooth, with just the right amount of tension. I’ve uploaded a short video showing the XTAR DRAGON VP4 Plus in action. I should make it clear that it can only run test, or refresh, or charge mode on all slots at the same time. It can be charging and discharging during test or refresh mode in different slots. I think this “limitation” is part of XTAR’s aim to make this charger simpler. I’d agree that dropping the 3S charging and data logging to decrease the price of a further model would be good. The test probes are actually quite useful to measure cells voltage and iR without having to put them in the charger (e.g. to know whether a cell needs charging after use, or to test resting voltage) . However I would prefer voltage, and (as accurate as reasonably possible) iR readings in the slots as well. As mentioned before, I expect that this charger will sell very well to the non-charging hobbyists, an thus I don’t expect to see any major changes for a long while. I would expect that XTAR know there own market better than us? Discharge current is at least half of the charge current, at either 0.5V or 0.25V. I don’t quite understand this? What is the maximum discharge current? Thought it could charge at 2A so if you mean amps, can it do a 1A discharge? 0.5A would be painfully slow on a 32650 or even a 5200mAh 26650! Yes, at 1A or 2A charge rate it will discharge at 0.5A. This is due to the amount of heat that is generated during the discharge process. Discharge rate seem to be similar to its peers. Not even close, e.g. the Opus C3100 can discharge at 1A in all 4 slots (and its less than half the price to boot). do you own the Opus C3100 ? Seriously, that’s 2 watts on a fully charged Li-ion, my sc-608 does 1.4A and that’s not exactly great for a real comparison to what capacity you would get at modern LED drive levels. The fan missing is not a positive, if it’s required to dissipate even a measly 5W then so be it, 10W+ is really required. Granted the silent running is a plus whilst charging or low discharge but it could cut in only when necessary. Please don’t think I’m attacking you, the review is great, I just think the product could be better is all. I’d be interested to know if XTAR dropped the fan in the design process due to the high level of complaints about the (?? low quality) fan in the Opus? I quite like the silent running of the DRAGON, but saying that, I barely notice when the fan in my MacBook Pro is running. Putting biases, personalities and vested interests away from this thread, THIS. OP has been updated with a bit more clarity around discharge rates, modes, and another % charge anomaly. Instead of rereading the whole review what is the charge % anomaly? I actually like both brands. I have a couple of Xtr VC2's and recently got the smaller Opus BT-C100. My only complaint for the Xtar's is they don't seem to like charging 14500 cells. You have to get them in just right. The Opus I'm still experimenting with. It does seem to take a very long time testing quality 18650's. I do like the option of 1.6 Amp charging if I need one on the run. I would still purchase either brand at the right price. I will add a couple of things. Not seeing voltage would stop my buying if it is a charger designed for testing cells. However, even with on screen voltage once I remove a cell showing full at say 4.2. They never meter at that. I have more DMM's than I can keep up with and all get a reading of closer to 4.1. 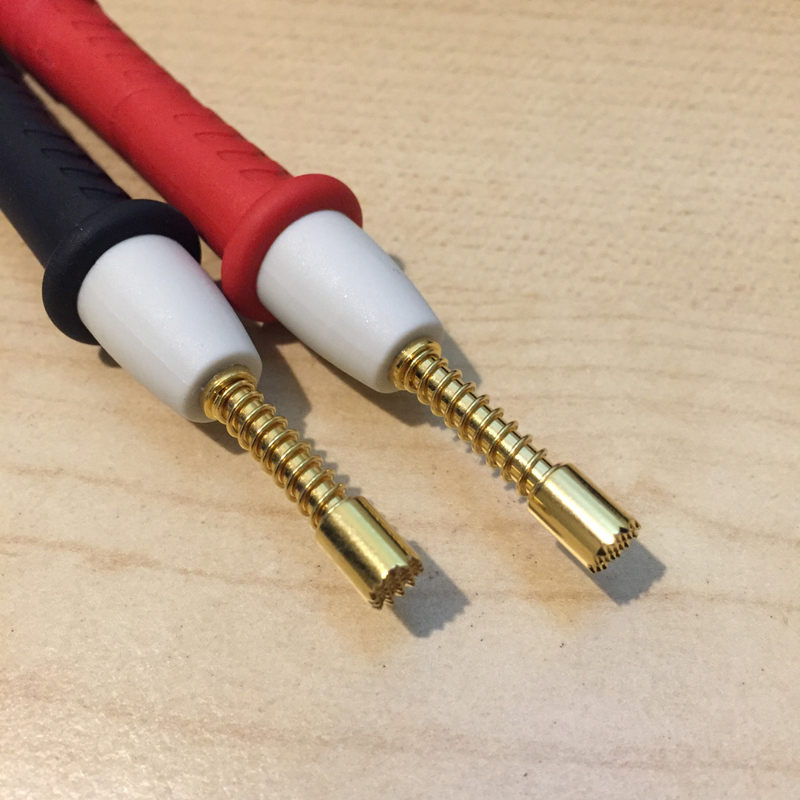 On the flip side I attribute this to using the standard leads that any given DMM came with. So I'm probably easily loosing that tiny amount due to the length of the lead wire. Either way excellent review. Adding video was a great touch. That as 1% charge is somewhere in the region of 3V (exact figure unknown) that the charger shows 1% for quite some time when discharging, which is done to 2.6V. A test yesterday saw around 400mAh discharged from a 2 protected GAs whilst on 1%. yikes, thats crazy, i have not tested any discharging on this charger, just charging of various brands of li ion and NiMH cells. I would agree, too many idiosyncrasies for the % charge to be truly useful. Though, it would not stop me recommending this otherwise excellent charger. As mentioned in my review, I would much prefer voltage reading, and the bar graph graphic for approximate % full indication. 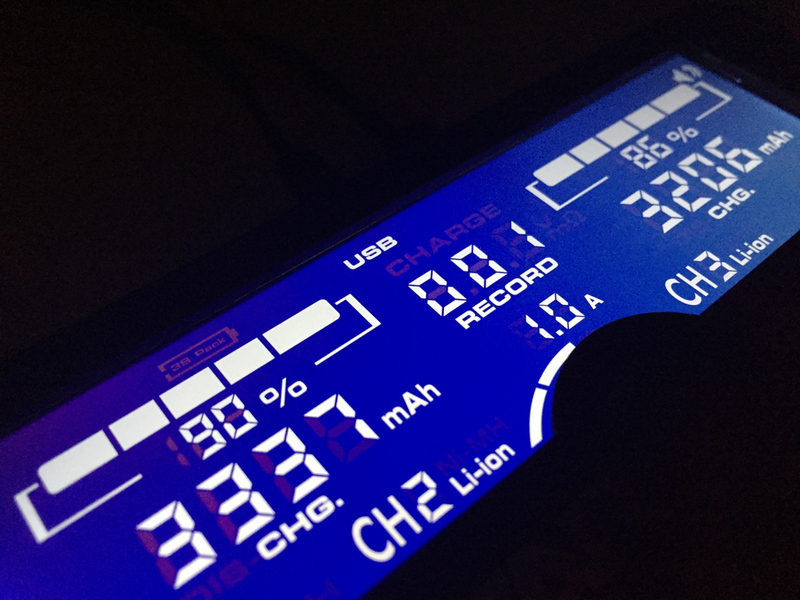 Have you noticed that chargers with digital readouts of charged voltage does not stop charging right away when 4.20v appears? My Opus and my iCharger shows that. It’s because even if the voltage show 4.20v, I observed that about one-fourth of the mAh energy pumped into the cell is still in this stage, so while the voltage stays at 4.20v, you will notice that mAh is still pumped in while the ma or the rate of the charging slowly goes down to 1/10th of the chosen charging rate, eventually filling up the cell and showing Done or Full. In others words, when 4.20v shows, we don’t take the cell out right away but still wait for the charger to detect a ‘full’ cell. In short, a charger with voltage readout has no inherent advantage over a percentage one because we still have to wait ‘Full’ or ‘Done’ or the green led to show for a fully-charged cell. This is part of the constant current/constant voltage algorithm. When the battery voltage reaches 4.2V the charger switches to constant voltage mode and starts reducing the current until the termination point in order to fully charge the battery. Yes, I know, and that’s my point, no real worry or agrument to whether it’s percentage or voltage, since we still have to wait for the CC stage to drop to 1/10th for the charger to terminate, even if the CV, whether in percentage (100%) or the 4.20v has just showed, as it’s not yet truly full. It boils down to personal preference between digital readout or percentage. Even if they changed % to be somewhere more realistic such as 1V, the discharge in test and refresh modes goes down to 0.85V, so there would be still be 01% displayed for a quite a while on discharge (note: when on discharge the % charge never goes to 00%). My Lacrosse BC700 considers 0.9V to be empty, i don’t know how much energy there is between 0.9-1.0V but i can live with 0.9V as the cutoff point. Like i said there is no perfect one size fits all here, but i bet we agree that 1.25V is not empty. If you have voltage and current reading then it is easier to see where you are. Once the 4.2V CV is reached you can watch the current drop. I’m sure Xtar have been suggested this but they don’t seem to listen unfortunately. This is an old review. But I still found this review quite useful. Thanks to the author for posting his views in such clear to understand and helpful manner. He also covered several points of public interest which many reviews do not.